A healthy life revolves around many factors usually physical well being is dependent on an approach which caters to both diet and exercise as an essential part of our lifestyle. Exercise brings about fruitful changes like increasing cardio metabolic health and reducing the risk of diabetes and heart disease, but it’s not a very effective intervention for helping people lose weight, according to researchers. If weight loss and fitness is the main aim then it is certainly diet that can help you out. There are a number of reasons the benefits of a healthy diet outweigh the fruitful effects of workout. It seems that a lot of energy is expended by us while we work out but the reality is totally different. There is no doubt that exercise makes it possible to burn calories but it also results in making one more hungry. It is noticed that individuals compensate the calories burnt while exercising to calorie intake known as calorie compensation. A sedentary lifestyle has an overall adverse impact on one’s weight loss program. Exercising aggressively for a while and then being slow and inactive throughout the day does not help at all. Rising obesity levels around the world and especially in the United States in a huge concern. Even though the gyms are flooded by people and fitness gizmos still the problem is not solved because our diet is rich in saturated fats and sugars. This is why it is important to focus on the balanced diet rather than tiring yourself out. It is believed that you cannot out exercise/run a bad diet. A diet rich in vegetables and fruits and lean proteins can yield more benefits than working out. So design a diet that suits for a lifetime and feed yourself with care and fuel up your body with the right foods. Meanwhile adhere to regular exercise regime for both fitness training and aerobic activity. The key to a healthy diet is taking right amount of carbohydrates, proteins and fats. Health experts suggest that 50 per cent of your plate should be made up of v non-starchy vegetables and fruits. The other 25 per cent of your plate should consist of protein found in fish, poultry, red meat, low-fat cheese (cottage cheese, feta, mozzarella) and eggs. other important components are wholegrains, legumes and starchy vegetables. Good fats, found in extra virgin olive oil, nuts, seeds and avocados, should make up five to 10 per cent. Leafy green vegetables, tomatoes, peppers, broccoli, eggplant, zucchini, green beans, asparagus, celery, cucumber, and mushrooms should also be part of your diet. In the weight loss battle go for smaller portions but do not deprive yourself of your favourite foods as there is no harm in indulging once a while at a restaurant, plan and make your meals interesting. Healthy munching of nuts like almonds and pistachios can be good. 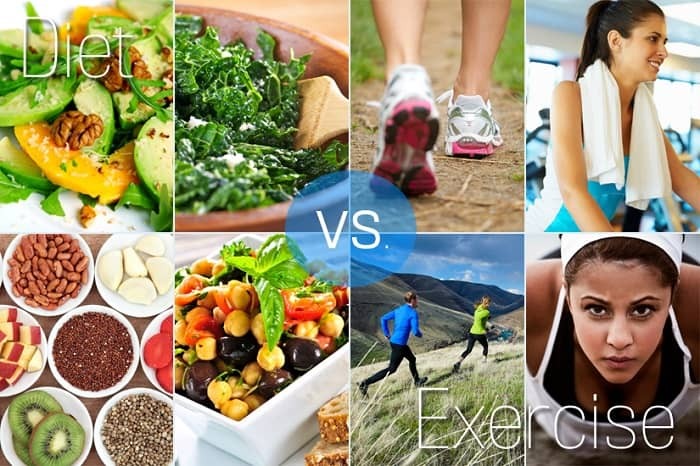 Improve lifestyle by boosting energy levels and mood levels by making wiser choices of both diet and exercise. A healthy balance comes up with not only a being physically active but psychological and mental well being is also a vital part of being a healthy self. It is vital to make healthy food choices to achieve optimal results. What do you prefer? Exercise or eating right? Let us know in the comments below.